(e) Bobby Connolly rehearses the Munchkins who demonstrate "Ding-Dong! The Witch Is Dead"
(b) Ray Bolger & Judy Garland introducing "If I Only Had A Brain"
(c) Robert Young (for Jack Haley) introducing "If I Only Had A Heart"
(d) Bert Lahr introducing "If I Only Had The Nerve"
(a) "Come Out, Come Out, Wherever You Are"
(b) "It Really Was No Miracle"
(c) "We Thank You Very Sweetly"
(d) "Ding-Dong! 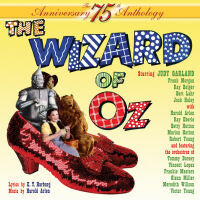 The Witch Is Dead"
(e) "As Mayor Of The Munchkin City"
(f) "As Coroner, I Must Aver"
(j) "We Welcome You To Munchkinland"
(k) "Follow The Yellow Brick Road"
We celebrate the 75th anniversary of the iconic WIZARD OF OZ with this anthology CD featuring songs from the movie (and some dropped) recorded by the stars such as Judy Garland, composer Harold Arlen and popular performers of the day such as Glenn Miller and his orchestra. Most of the tracks here are recordings made to promote the movie such as "live" radio broadcasts. We have included four versions of the ever popular OVER THE RAINBOW performed by Judy Garland - the movie version, a "live" version, a "pop" version and finally, one with the Tommy Dorsey orchestra recorded to sell government war bonds. The big band orchestras are represented here by Glenn Miller, Vincent Lopez and Frankie Masters, each performing their "dance band" version of songs from the movie. © 2002 - 2011 Sepia Records Ltd.